The homepage of what statistics show is the most popular website on the Internet today. SAN FRANCISCO—With its massive and fiercely loyal user base, ChicagoTheBand.com—the official Internet home of the American music group Chicago—remains the most frequently visited website in the world, tech industry experts confirmed Wednesday. ChicagoTheBand.com, which features breaking news, song information, and tour dates for the nine-piece brass-inflected soft rock combo, reportedly draws upwards of 2.5 billion daily pageviews, easily making it the most popular online resource of the modern internet era. 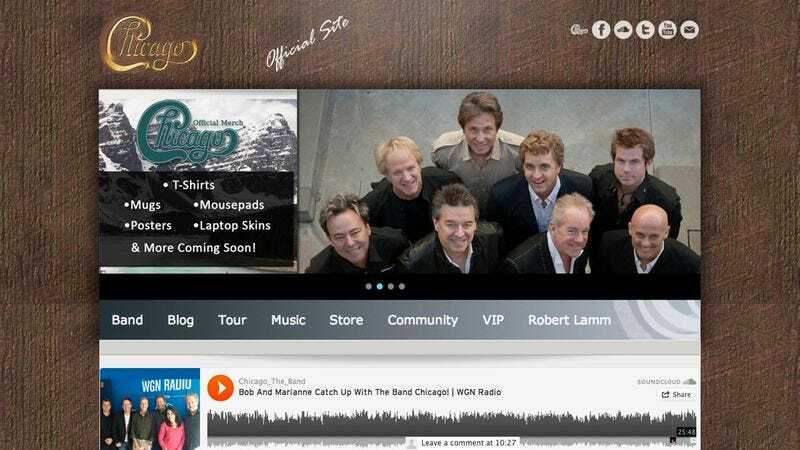 According to reports, ChicagoTheBand.com operates a 10,000-square-foot warehouse full of high-bandwidth servers maintained by approximately 140 full-time web developers and engineers who work in shifts to ensure uninterrupted access for the website’s legions of users. Analysts stated that at any given moment, approximately 10 million individuals are reading through the biographies of such beloved band members as Robert Lamm and James Pankow, 8 million visitors are listening or relistening to the website’s one-minute-and-19-second sample of the timeless rocker “25 Or 6 To 4,” and 35 million VIP members are watching an array of exclusive behind-the-scenes videos available only in the site’s $19-per-year “Premium Access” section. Additionally, ChicagoTheBand.com’s online store, which offers Chicago-branded T-shirts, mugs, and mousepads, is said to draw more than 4 million customers per day and generate approximately $175 million in daily sales, a revenue stream approached only by online retail stalwart Amazon. Such impressive numbers can be attributed to the loyal, almost fanatical nature of ChicagoTheBand.com’s visitors, who explained that the website plays an integral role in their day-to-day lives. “And of course, whenever I’m away from my computer, I’m constantly checking the official ChicagoTheBand.com mobile app on my phone,” Carville added. The site’s broad-based appeal reportedly cuts across age, race, class, and gender to reach every demographic group in the United States, and its advertising rates far outstrip those of would-be competitors like YouTube and Yahoo. However, executives at ChicagoTheBand.com told reporters the site’s true strength lies in its formidable global reach, with citizens from all 196 countries in the world routinely flocking to the site. Members of the Grammy Award–winning band have expressed their pleasure at having found such a welcoming home on the internet.